We are currently renewing our product range, the B44 has been discontinued and a replacement will be announced in the coming months. The A44/S6 is still in stock. If you would like to bundle our S6 sub choose from one of the + S6 sub options. All S6 sub options include everything needed to connect our S6 sub to your amplifier. 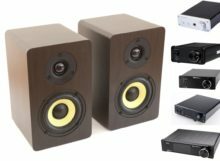 If you are having trouble deciding which bundle to choose we recommend the Topping MX3 bundle – the MX3 has all the features you'd want in a desktop amplifier at a great price. Topping MX3 / Breeze Audio Amps: Please specify black/silver colour preference in order notes. Black will be sent if no preference is specified.